A fresh blanket of snow covers Yahtzee when I arrive to tackle another day of boat projects. Before heading below to switch on heaters and plug in power tools, I spend a few minutes shoveling the cockpit and decks, and pushing snow off the solar panels on our hard dodger. Pretty soon the sun breaks over the tops of the mountains to the east and fills the marina with light. I stand for a moment soaking it in, watching it slowly illuminate freshly covered peaks that tower above town with a brilliant alpenglow. 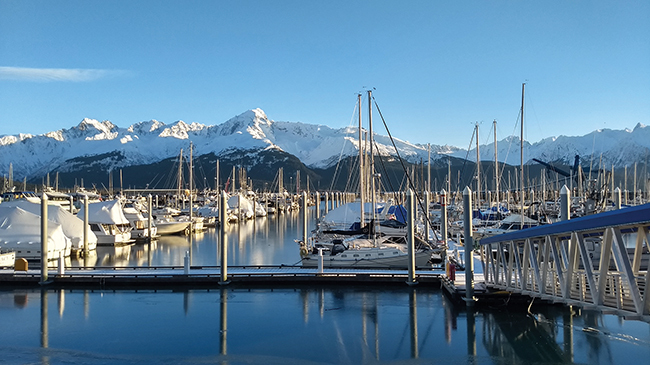 Savoring moments like these is part of what makes wintering in Alaska so special. Gone are the tourists. Gone are the cruise ship passengers. Gone are the campers. Gone are the visiting fishermen and boaters. Gone are the seasonal workers. Gone is the picture of Alaska that is carefully presented in glossy brochures and advertisements to people in the lower 48 and elsewhere. What’s left is a truly unique place that I’m glad we’re getting to experience. But stopping here has also helped me get the picture of what it means to take a break from the cruising life and the many rewards it has to offer. Hitting the pause button allows us to reset and refocus. It provides a fresh perspective on where we want to go from here and how we’ll likely find ourselves stopping like this in destinations throughout the world. The truth is that pausing along the cruising journey means different things for every cruiser. And it’s different every time you stop. For some, it entails pulling the boat from the water, putting it on jack stands and leaving it for hurricane season. For others, it’s winterizing and covering. Yet for others, it’s leaving it tied in a slip with a web of lines and hoping for the best. While we’re enjoying the fruits of winter in Alaska, cruising friends have buttoned up boats in Vanuatu and Fiji. And while those locales are vastly different in their geography and weather than here, the dance of putting away the boat isn’t all that dissimilar. Sails come down, get folded and stowed. Provisions get removed, eaten or donated to locals. Canvas comes off and running rigging gets tidied up. And though the effort involved with putting the boat away can be time consuming and difficult, it’s the anticipation of setting it all back up again that keeps us going. 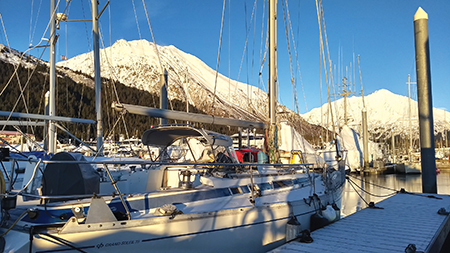 Yes, spring sailing is a welcomed glimmer in our eyes — even if we are snowboarding and skiing at the moment. Andrew, along with wife Jill and sons Porter and Magnus, live aboard their Grand Soleil 39 Yahtzee. Follow their adventures at threesheetsnw.com/yahtzee.